As the way to the Lost City of Omu gets ever closer to being found, the citizens of Port Nyanzaru are in a frenzy preparing! With bags being filled to the brim with necessary provisions and the streets full with packed mounts, now’s the best time to get ready for the expedition into the unknown! 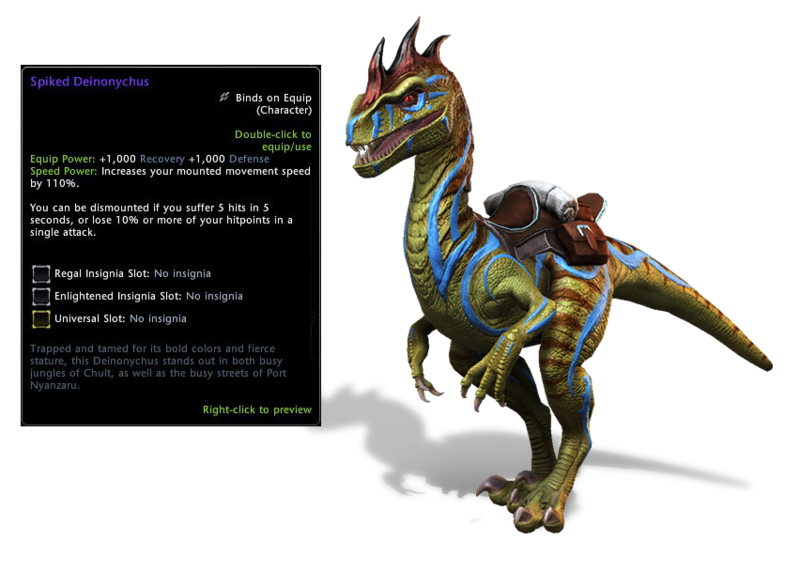 The Expedition Pack is filled with unique and necessary items for your trip into the Lost City of Omu, including a brand new mount to take you there, the Spiked Deinonychus! And an expedition isn’t the same without a proper entourage! 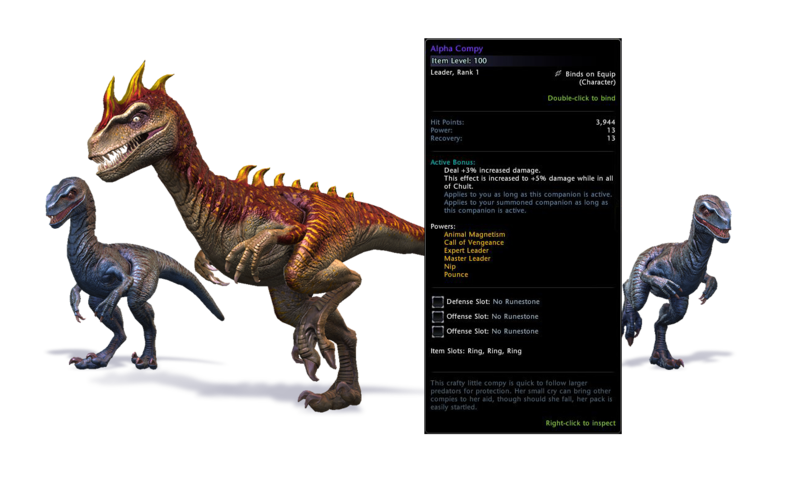 With the Alpha Compy companion at your side, she will influence your damage as well as call other compies to her aid; she’ll bring much needed support into the dark jungles of Chult. But before this excursion can start, you must also be able to dress the part! 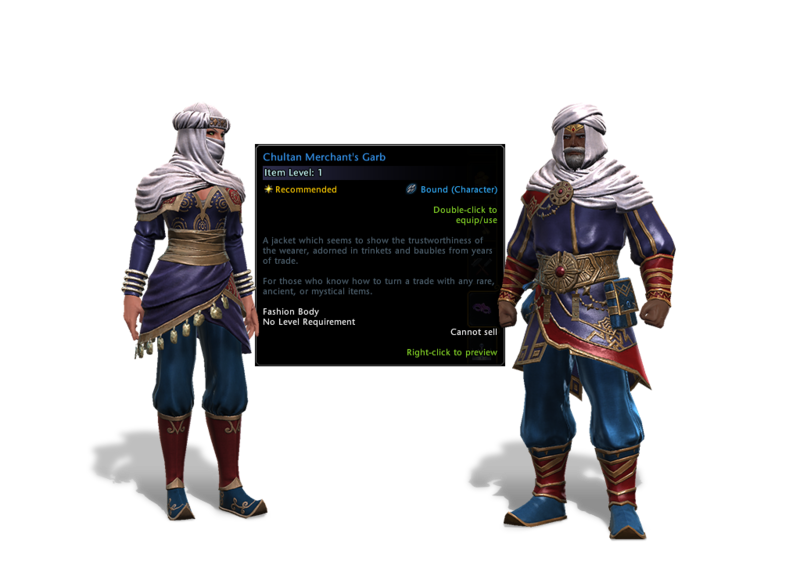 The Expedition Pack also comes with a new Chultan fashion set, as well as a transmutable Batiri Mask. With all this in your possession, the Chultans will willingly give you the title of Expedition Leader and the benefits of being a VIP, making this more than worth your while. 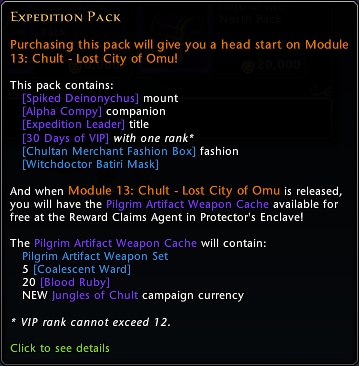 Besides all these great items that you will get right away from the Expedition Pack, there is one extra item to be claimed once Module 13: Lost City of Omu goes live! With the purchase of the Expedition Pack, The Pilgrim Artifact Weapon Cache will be yours to pick up free at the Reclaims Agent! 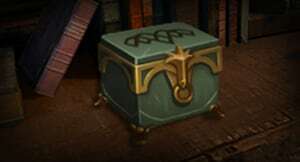 The Pilgrim Artifact Weapon Cache contains the Pilgrim Artifact Weapon Set, which carries both Primary and Secondary Pilgrim weapons, appropriate for the class that opens it. 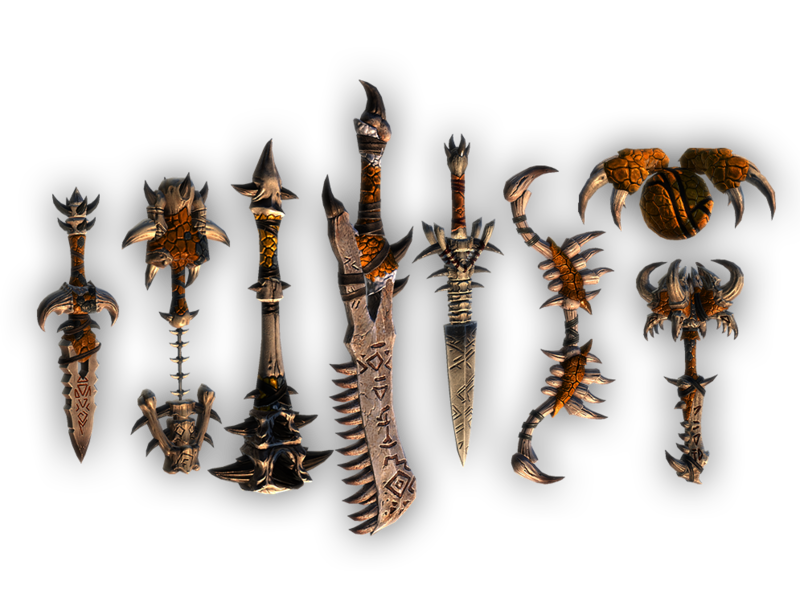 With this new artifact weapon set, you will also receive Coalescent Wards and Blood Rubies to help you refine and upgrade these new weapons! With all these items available to you, including 100 Lost Idols and 500 Omuan Treasures (the new Omu Campaign currencies), you will be more than prepared for any adventure that awaits you! If you are interested in becoming an Expedition Leader, please check out the Zen Market for this new pack that is available for purchase now on PC and a later date on Console! Note: Pack can currently be purchased in the Zen Market at the early bird discount price of 7,500 Zen until February 27. Base price after that date will be 10,000 Zen.